Search engines do not stop changing, from how they process and understand information to the end user’s experience. The evolution of search is driven as much by new technology, changing user expectations as it is by optimisation activity from the content creators. It is the ubiquity of smart devices and mobile computing that will generate some of the more interesting innovation in this space. There is no good reason to confine search to the browser, and every reason for it to become a service, an invisible layer between the user and the rest of the world, a part of the devices and other software tools we use, and not a destination. Typing is so last century. Formulating a query to suit an algorithm to get a relevant result is a relic from last decade, and clicking on links to actually get what you wanted is a failure in user experience. Web based search engines are a result of the constraints of technology, their user experience model a relic of static HTML directories and a less responsive internet. However a lot has changed in the last few years, and both the queries and their results have changed. 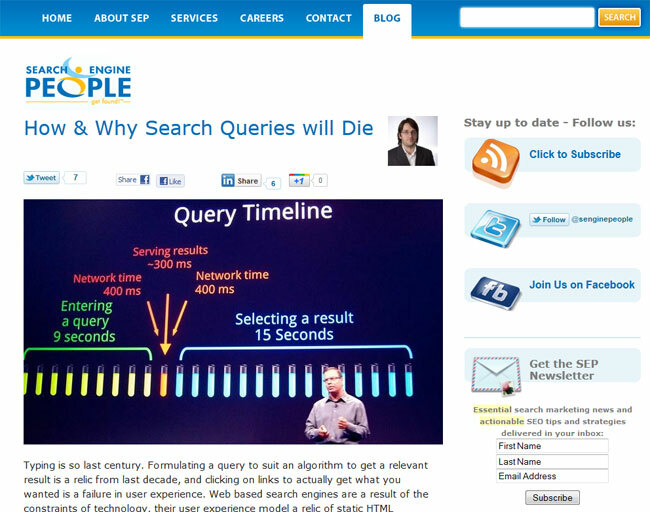 Read more of How and Why Search Queries Will Die on Search Engine People.